On Second Scoop: Ice Cream Reviews: Haagen-Dazs Trio Ice Cream Coming Soon! 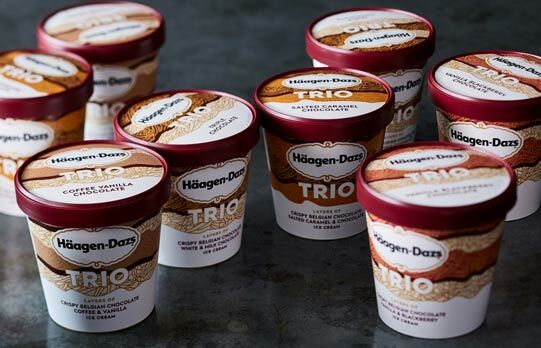 Haagen-Dazs Trio Ice Cream Coming Soon! Do you know what we have here? According to Haagen-Dazs, it's actual insides of one of their new Trio "pints". How epic does this look? We talked about it on the Nosh Show and I was very curious how Trio was going to work. H-D was nice enough to tweet back and verify this is how it will look. I've looked at this picture several times and it still blows my mind (I do love an epic crunch factor). I wish I could convince H-D to give me a tour of the machine that packs these containers! Those are the four Trio flavors coming out this year. We actually scoured a couple of Providence grocery stores this morning to make sure that they hadn't gotten it before my area did. Are you as excited for these as I am? Thanks to Patrick for pointing out that the H-D website just updated. It looks like we've got three new ice cream bars on the way in a packaging that is kind of similar to the Trio packaging. Two of these look delicious, and the third one I will probably never try but I'm sure some of you will thoroughly enjoy. 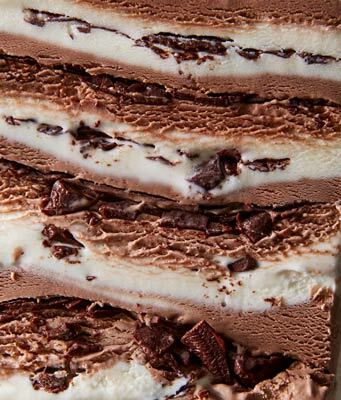 Coconut Dark Chocolate Caramel ice cream bar is "coconut ice cream and ribbons of rich caramel draped in dark chocolate and finished with flakes of toasted coconut"
And someone else has pointed out some of the new ice cream "pint" flavors that are available. toasted coconut caramel is swirls of dulce de leche caramel and toasted coconut flakes in coconut ice cream. bourbon praline pecan is bourbon ice cream infused with brown sugar bourbon swirls and the praline pecans. Apparently none of these flavors is meant for me to try. Question: how do you feel about the new pint design? When you put them side by side, it's easier to notice that the backgrounds are not identical. And more importantly, which one will you grab first? One more that was added later: Peanut Butter Salted Fudge is salted fudge and the crunch of chocolate covered peanuts blend with smooth peanut butter ice cream -- I reviewed it here and it's excellent, big fan of this one. This is the best time of the year, isn't it? Ben and Jerry's pint slices will be coming soon as well- ice cream bar-like concoctions- woohoo! Definitely excited to purchase and try these flavors. I'm proud of Haagen Dazs and their commitment to high quality ice creams that are available locally (versus just online). I am BEYOND excited, being HD is my favorite premium brand, and especially since my ShopRite didn't stock any of the seasonal Peppermint Bark this year. Needless to say, I'm jonesing hard for something new from them. I have noticed my grocer has HD on sale all month for $2.88 a pint, so I'm thinking they're making room for the new Trios. The blackberry one in particular looks delish! Tons more new flavors updated to their page and they sound great. It also looks like some of the Destination Series are now regulars (so happy that Vanilla Tangerine and Shortbread survived!). Looks like Sesame Brittle, Mango in the ice cream form, and Mayan Chocolate all got slashed (all at the bottom of my list so not too upset). nice find! I was just on their site last night but apparently I was way too tired to notice (I saw brownies a la mode was in the mix but didn't go through the list one by one). I'm actually pretty proud of them for keeping their website up to date like that (keep in mind that just a few days ago, their latest "news" was that the destination series was coming out). I'll upodate the bottom of the post with the other new stuff. About the only Breyer's flavor I can still go for is the chocolate crackle, and this reminds me of that, cranked up to 10, of course. All 4 of the Trio line are non GMO. Nice to see they are thinking about that when introducing new flavors. I might have to give these a try! I hated Ben n Jerrys Core line with the passion of a hundred burning suns, but this sounds sufficiently different. Oh wow, I love the trio pint containers but I'd never be able to tell them apart from one another! I think I'd try the blackberry first, then the triple chocolate, then the caramel, and the coffee last (I don't like having any caffeine too late at night which happens to be the only time I sit down and destroy a bowl of ice cream). I'm honestly more intrigued by the toasted coconut caramel and bourban praline pecan ice creams, I would try those before the trios! BUUUUUT. Most of all I'm excited for the SEVEN new flavors Enlightened is releasing this week on their Facebook page! I probably won't find it in the store for at least a couple months, but I'm really hoping for a red velvet or cotton candy flavor! I love eating pints of ice cream at a time, and Halo Top/Enlightened are far better than Arctic Zero (which is also releasing some new flavors - or "flavors," sine their frozen desserts already don't deliver any flavor in my opinion). I'd pick Espresso cookie crumble first out of the three new pints. I don't like the new alcohol ice creams much since I don't drink. I am very excited about the trios and will try them all. Those bars look amazing. Now if only that vanilla cookie one was coffee instead... gold. P.S. On the Toasted Coconut Caramel: Samoas. Think about it. BTW These are not PINTs they are 14 floz, (I call them the space saver "pint") just saw the Trio at Safeway almost bought the 2 flavors they had, no idea how they make this. Would love to know. stbernardo: what state did you spot it? I have been stopping in supermarkets every time I pass one to check. So far, I have found pistachio in the new container design at a Smart and Final and coffee in the new design at Vons, but none of the new flavors. @stbernado: ha, yes, we know this all too well. Many years ago I coined the term "faux pint". They arent the only ones who do it, they are just most well known one that does it. You are the first person I know who's found them! So, I was right. Found the double chocolate one, and it really did remind of a better version of Breyer's chocolate crackle. And add to that, only the ice cream was clearly better, as the chocloate was of similar quality, but I think that's more a result of Breyers fighting above their weight than HD going below theirs. If I fin the blackberry one I'll probably try it, but not super excited. I check their site the way other people check sneaker sites or eBay. 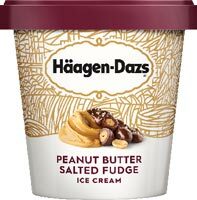 I am a huge Haagen Dazs fan, and almost wept when I saw all the new flavors (though I really wish they'd bring back Bananas Foster). I'm excited about the Espresso Cookie and the Toasted Caramel. As for the bars, I'd like the White Chocolate Raspberry if it were coated in milk chocolate, as I'm not a huge fan of dark chocolate. The new pint designs will take some getting used to. Just tried the bourbon one. A bit strong and not as tasty as graeters bourbon which is heaven!!! I miss the old print, but I'm sure I'll get used to it. As long as they don't sell out and go the clear Talenti route. The toasted coconut caramel is heavenly. I don't like flakes of coconut in anything, but they were fairly light-handed with the toasted coconut flakes in this flavor. I hope it's permanent. Why not have vanilla, chocolate and strawberry flavors in one container.